OMG!!! where can i buy one!! Can’t see how this would be any better (if not slightly worse) than a 3D Connexion item, which is a bit more comfy to use, a bit cooler looking and a lot cheaper? Looks good. But only if it is cheaper than the 3D Connexion Space navigator will it be truly great! Also point modelling is a drag. This looks like an ergonomic nightmare. Although I like the idea, I have seen much better looking and more intuitive 3d mice before. This differs wildly from the 3D Connection device. 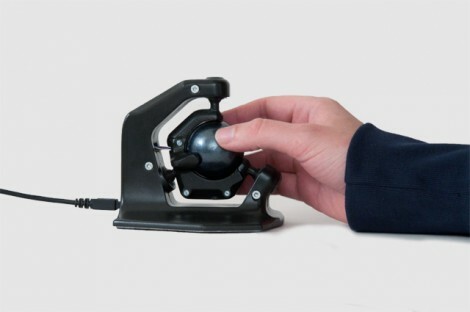 The 3D Connection functions like a joystick, this one works like a track ball or mouse. Adoption of new input devices seems poor, people like using the mouse. Have you ever taught a computer class? Most people have difficulty just mastering the click/select delay couldn’t imagine this replacing an existing mouse. I could see using something like this for gaming. No need to use 2 hands to play l4d2 but then again I don’t see the fire button on this thing. …”Arduino” powered? You mean Atmel powered, right? There is no MCU called an “Arduino”. Lol. @Junkman: this is NOT a replacement for a mouse. Just the same way like the 3DConnexion Space-mice aren’t! Don’t confuse stuff here please. @Edward: nah, i don’t think this thing is acting like a trackball/mouse. It still is a spacemouse, but the difference between the 3Dcon ones it is not navigating the camera, but the objects. As you can see in the video, when the ball is being turned, the object turns too. If you turn the control on a 3DCon spacemouse, you are turning the camera. The major advantage of this one is, that the ball has full motion. if you turn it, the object is turned…if you turn it back, the object is turned back, too. on a 3DCon spacemouse you just say how fast the object/camera is going to turn in a direction. If you release the control there, it will stop turning, so it should be easier handling rotational movement with the Axsotic mouse. This would be an epic gaming device with the addition of buttons and vibration. Valentin is a dude, not a dudette. actually the ergonomics don’t look TOO bad. the ball may be a bit high. there are other normal mice that put your hand in a more sideways position to keep your wrist off the desk. i use a 3dconnexion spacepilot daily and i don’t really see the benefit here. there may be a more direct link between turning the ball and turning the object. so what? i can still use the spacepilot just as effectively. plus i get mappable buttons and alt-ctrl-esc-shift so i don’t need to switch hands over to the keyboard. @BitMage, yes it would be an epic gaming device. we have a internal firmware that let us play quake, wow and counter strike very well. You can focus two targets and switch perfectly between them. And you can do all movements with one hand. your second hand only needs to fire and do the rest. No it doesn’t, the only difference, to the user, is the 3DConnexion device does not continue to rotate, you just hold it rotated. This means less work for your fingers and fewer fiddly supports in the way of your object motion. The 3DC provides exactly the same full 6 DoF motion, it just isn’t as fiddly. Sorry, cool looking thing but seems like a solution to a problem that doesn’t exist, or rather that has already been solved by a simpler device. and best of all they are available dirt cheap on eBay take a look! It will change your life if you work on cad for your job. @James Rotation is the task you perform most while working on free form modeling. And this little difference is a major step. Because you have a intuitive and natural interaction with your work that gives you all the benefits your finger have. They are able to rotate. They are also able to rotate or make translations. Both very precise and separated from each other without failure. This is not possible with the 3DConnexion device. Your hole hand is doing the rotations and translation with the same finger position. you can not separate and you can not use your beautiful interface called human hand (fingers and thumbs) in any way it can be used. The simpleness is 100 % of its usefulness. We also did tons of 3D-Prints for a perfect suspension that gives you the maximum freedom you can have for rotations. Any little part from sensors up to springbodys is optimized in a way, that you have maximum freedom in rotating the ball. This kind of optimizing was not able without arduino, teensy, processing and a 3d-printer. It just speeds up the hole development. Just sketch something and look if its better then the one before. There has been one point we even make smaller parts we could snap in to the bigger once for the suspension holder that let us print faster new versions of it. Its just insane how fast you can work with those open-source technologies. The best thing is, Designers and engineers can work hand in hand with them. LOVE IT. I Think the novel part of this , is he went from building lights that could well end a life (lol) using an arduino a garbage can , and a rubbermade box to making a marketable device using the skills he acquired. Even you nay sayers probably can’t honestly say you would turn one of these down. dur wrong light , but same diff. Not wishing to be contrary or difficult but you can rotate and translate separately on the 3DC – I do it day in day out with various 3D packages? I can’t endlessly rotate with my fingers, no, but I’ve no need to – rotational pressure on the 3DC provides endless rotation in whatever axis I choose. Sure I can’t “walk” my fingers round the 3DC but I don’t need to, I can do exactly the same on-screen motion without moving my fingers more than 2mm. If I want to rotate it I keep my fingers pretty much still and rotate the top of the 3DC in whatever orientation I choose. If I wish to translate it I push/pull/slide it whichever way I want. If I want to do both at the same time I can do that too, I just twist and push lightly. I don’t see what yours does over the 3DC – it has exactly the same functionality but with less finger motion? I, for one, think it is awesome. I was a professional in the 3d field for a few years and always hated the input options. I currently work with 3d connection devices and find them quite awkward. @all about hand fatigue. yeah, its an issue with ALL 3d positioning devices. you generally reach over, adjust, then move your hand back to your keyboard. I never liked them much for modelling, but texturing supplies the right timing for them to be quite nice. I work with several engineers that use the 3dconnexion ones religiously. In fact, I’m not being a naysayer, I’d love to see what benefit it gives, but I just can’t see it. I’d happily be shown something that I can’t do on my 3DC that you can do with that? @James, I would love to just give you a presentation. I think since your working for years with your device you just should hold ours in your hand and look for your self how it is working. Your not by any chance in germany, boston or San Francisco? We have been able to give more than 50 small presentations to professional 3d-artists on a tour here in germany and even those who know the 3DC device said this one is much more intuitive and nicer to work with. Everyone got the concept during a 1 minute it needs hours to learn how to use the 3DC Devices. I also think once your used to it and it is best for your workflow, there is no reason to switch to something else. Never change a……. I mean once your used to a 3DC Device. I’m in the UK, which is a shame. I think I understand how it works, and I feel it’s pretty much the same as the 3DC but with a moving ball rather than a resistive spring-loaded “top hat”, I’m just curious as to what the benefit of that is, but I think it’s possibly just personal preference. The 3DC was a revolution in 3D modeling, for me, but I’m always game to see improvements! From the perspective of a 6 Dof interface, there is no difference, both are 6 Dof interfaces. But B/W and Color Movies are both still Movies. The little difference is the Color. Stories can be told in both. Only Windoiws/Mac compatibility mentioned on the website, nothing for free or open Operating systems. No mention whatsoever of When/where and for how much it will be available. Therian is right – any device that requires the hand to be held in the air, without a rest pad is doomed to failure. Light pens were the best example. Anyway, this #D controller is not too much different from the SpaceBall which has been around for many years. I must have seen it 20 years ago on an Apollo workstation I think. Hmm id probably try a novint falcon mouse before this one for 3d work. Id like to be able to have more room for movement rather than a pressure sensor. Reminds me a bit of the novint falcon controller. I think the critique about holding your hand in the air being so tiring ignores the fact that you can see that the arm and much of the wrist is on the table, and with the 3D-connexion spacenavigator you need to have your hand above it to, although I admit I think the spacenavigator seems more comfy. As for the video, it’s odd that they demo it with a lefthander (I assume from seeing the manipulation of both the object and the drawing simultaneously), since that sort of makes it seem odd and less appealing to righthanders and those are in the majority. @nomad You made good points except for one detail: the 3D connexion devices let you select if you wish to move the object or space/camera, it’s not just one choice. @RBRat3 I see it made you think of the falcon too, but that’s not a 3D mouse for working on stuff, it’s a gamecontroller, with forcefeedback – which is a big part of the appeal of course. Yea Its main selling point is for gaming but I dont see why you couldent use it for 3d work, It is a 3d mouse it uses an x,y,z axis 4in of movement all ways. The fact that we’re quibbling over the design speaks volumes for the well thought out and complete nature of this project! If you lay the thing on it’s side then your wrist wouldn’t be at such an awkward angle. Is it me, or does this look like the top of a Voight Kampff machine? SOLD! Where to i buy this? One thing to note for anyone who says using a 3DC is awkward is that the axes are configurable. I found the default installation settings for the axes awkward, but after adjustment, they are now an extension of my wrist. This is kinda like preferences for the controller in an FPS. This looks like a SpaceOrb. Was around in 1995, and you can get them for like $50 on ebay still. Serial interface though. Used to get a free SpaceOrb with games like Descent or Forsaken.